Just saying the name Palawan brings to mind the finest white sand, unlimited island hopping, and a night capped with live reggae music or the continuous waves of the sea. But these nice things are just bits of the entire picture that, in reality, also includes long waiting lines and crowded beaches. If you’re the type who finds this scenario horrifying, there are still resorts that offer you an escape from the crowd but that often come with a very expensive price tag – unfortunately. But that doesn’t mean you should lose hope. Going to the secluded parts of Palawan doesn’t mean that you have to spend more than a hundred dollars. There are still places where you can find peace away from the parties and become closer to nature, all for an affordable price. Find out about the best resorts to stay in while in Palawan that will let you have a peaceful vacation, all without breaking the bank. Roxas has always been a stopover spot for travelers going to and from El Nido. But a few consider it the perfect destination to stay and unwind by the beach. With the Kingki Beach House, you can feel like you have your own private beach while enjoying the freshest organic food. A room only costs around 30 USD. There are no restaurants around the area but the guesthouse is happy to serve you homemade meals. The accommodation may not be five-star but the staff will go out of their way to make sure that you are comfortable and that your stay is pleasant. When you have had enough of the sea and the sand you have to option to explore inland and hike through coconut plantations and some farmland for a change of scenery. 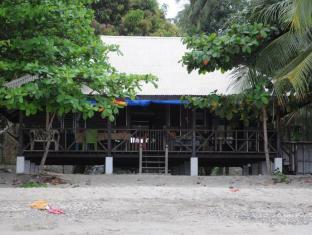 Tapik Beach Park Guest House is your private beach area in El Nido, away from the crowded main town. Guests can rent a boat to go to the islands and the must-see natural formations of El Nido. When you go to El Nido, you will automatically arrive in the center of town. As much as you can agree that El Nido offers convenience while being near the most amazing natural wonders, it’s also a fact that it’s overwhelmingly crowded. Tapik Beach Park is a great escape, one hour away from crowded El Nido town, proper. Here, you can have a peaceful stay, closer to nature, while still having easy access to the great islands, like Imorigui Island which will only take a 30-minute boat ride. It is far from all the nice restaurants in town but they have their own bar and restaurant where you can try some local dishes. Tapik is certainly not the destination if you are looking for five star accommodation. But if you seek peace, serenity and solitude off the beaten path then this is the place to be. Warm, friendly locals help make your stay a pleasant one. If you’re an early riser you’ll be treated to one of the greatest shows on earth as you witness the sun rising on a brand new day. Crossing the river to get from the beach to your room can be a brand new unique experience. Long Beach in San Vicente is still in its undeveloped and uncrowded phase. Never miss the unspoiled scenery of the pale blue sky, fine white beach, and rolling ocean waves of Long Beach, by staying in Turublien Long Beach Inn. The inn is indeed remote, as it sits on undeveloped 14-kilometer (8.7-mile) Long Beach. To get here, you’ll need to get to the small and quiet town of New Agutaya and walk along the beach. Finding it can already be quite an experience, but it gets more interesting when you see the accommodation and the beach, separated by a river that you need to cross, by using a small boat. Each room opens up to a balcony; if available choose a room with a view of the sea. The front desk is open 24/7 and the friendly staff can help you plan your day. There are loads of activities to choose from, including diving, snorkeling and kayaking. Get a fire going on one of the grills and enjoy a barbecue by the beach. Instead of heading to the popular spots of northern Palawan, go south to Brooke’s Point where you can enjoy the waters and seafood of Sulu Sea. In Sir Brooke’s Resort, visitors can take a dip in their outdoor pool, overlooking the sea. Enjoy sunny afternoons, barbecuing by the beach or fishing. If you just want to be lazy, you can stay in their native Filipino-style rooms, all equipped with a flat-screen TV, air conditioner, and comfortable bed. Both the beach and inland views are spectacular. There is a restaurant on-premise that will attend to your cravings. Be patient, though, as orders tend to take some time to prepare but when they do arrive the delicious offerings may help you forgive and forget the delay. As far off the beaten path as Sir Brooke’s Resort is, they do have a fitness center and workout room where you can keep up with your fitness regimen. Feel at home in the family-run Macapuno Beach Resort, another top pick, located in the underrated southern part of Palawan. This resort in the town of Narra gives you the luxury of unplugging from all the noise. Take note that there aren’t any restaurants near the resort, but you can have meals at their restaurant or you can cook your own food in their shared kitchen. Some of the activities you can do here include snorkeling, having a picnic at the Estrella waterfalls, or going on a day tour at nearby Turtle Island. Everyone who visits Palawan will first land in Puerto Princesa. Usually, you will only stay here for a few days because most of the attractions are near the beach and not in the city center. Getting close to the sea while in Puerto Princesa is still possible, by staying in Palawan Seaview Resort. It offers a relaxing view of the sea, filled with mangroves. Take note that it’s not swimmable but there’s an outdoor swimming pool ready for you to jump in, especially after hours of traveling. If you feel like roaming around the city, the resort has biking and car rentals available. 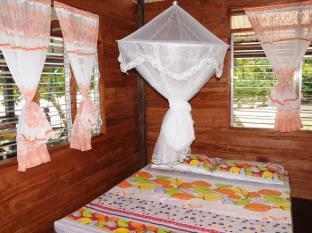 There are four cottages and eight rooms available near the white beach. Port Barton is a cheaper and less crowded alternative to El Nido. But, if you want to feel like a castaway on a beach with far fewer people than Port Barton’s main beach area, this Airbnb offer is for you. Electricity is only available in the evening in Port Barton but you won’t care when you are present with the sounds and sights of nature, during the day. If you’ve always imagined spending the night drinking fresh coconut juice while watching a bonfire, feeling the beach breeze kiss your face and walking barefoott in the fine sand, hop in a boat from Deep Moon Resorts Port Barton, to get you in this secluded area, right away. The Tribal Xperience lets you wake up right on the spot of endless adventures. The room in the cottages located at Bunuangin Beach, Port Barton. 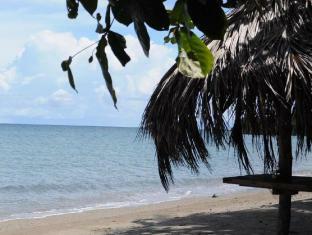 Be five minutes away from the beach and the gateway to the islands of San Vicente, with the Tribal XPerience. 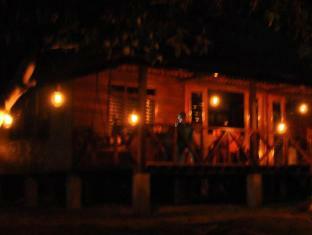 It is quite an experience, as you’ll be staying in cottages, near the forest, with the beach right in front. Tribal XPerience is located on Bunuangin Beach, which you can reach by boat in just 15 minutes from Port Barton’s beach. This spot is ideal for those who are ready to take on outdoor activities, such as hiking to see the highest waterfalls in Palawan, kayaking, and island hopping. Palawan Ecolodge may be located in a remote area but it is near hiking and snorkeling sites. It is required to stay for two nights in Palawan Ecolodge. 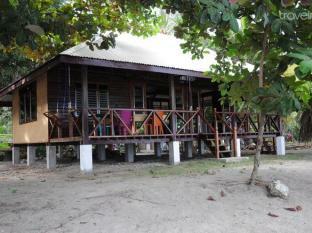 Go south and live on a deserted beach, where you can live like a local, in Palawan Ecolodge. It is located in Sitio Malakibay, Rizal, away from the usual tourist spots. All rooms are in a solar-powered house and there is also a playhouse that the kids can enjoy. Beach beds and hammocks are readily available so you can just laze under the sun. Don’t forget to savor the freshest coconuts and daily catch from the sea. You can have free access to kayaks and snorkeling gear if you want to explore the coral reef located at the northern end of the beach. Most of the spots around the ecolodge are best for adventurers who can take in hours or days of hiking, including Mt Mantalingahan, Mantayob Falls, and Turbong falls. The lodge can help you get authorizations for these areas. Staying in peace and comfort isn’t always an option in Palawan. If you’re going to open your mind to other unknown destinations, left untouched by tourist groups, you can absolutely still find affordable beach resorts that will surprise you with their services and beach views that are totally worth it. Make a trip to Palawan, today!